Sometimes when something’s wrong, I make a depressing playlist to burry myself deeper into my depression. Sometimes I know something must be wrong, because of the playlist I find myself listening to. Two- No :( make it :) Click on “Jimmy” by MIA, press the Genius button, and then have a dance party. Eh? haha, ohhh brighten up sal! Really hoping for some Imogen Heap, Steve. Can’t Rooney share The O.C. buzz (**cough* in 2006 *cough*)? Taha, I’ll go to the ends of the room, to show you my blue side. Scott, stop doing mesc/i have no idea who you are, but your comment makes me uncomfortable. umm the gossip girl ending to that comment just made my whole day. 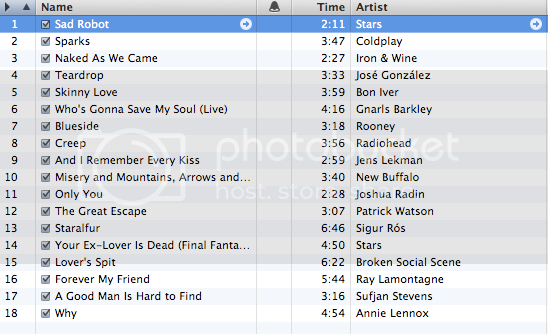 So far it’s just been giving me variations on the same playlist, and it’s failing to recognize a bunch of songs. Hopefully it improves. Scott, get some ‘tussum for that appropriately modern cough. Ada – I’m pro :). I like the way you move, nice jump-off point. Sal, how did you survive this? I checked the papers…it doesn’t say anything about you being discovered in your basement with your wrists slit. Call me to verify you’re still of this earth.